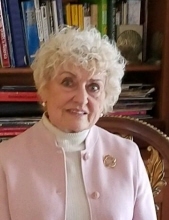 Carolyn Frances Stankiewicz Deodato, 86, passed away quickly from stage 4 pancreatic cancer at her home in Lawrenceville, NJ on Sunday, March 17, 2019 surrounded by loved ones. She was born on January 4, 1933 in Trenton, NJ,and was a lifelong resident of Lawrenceville, where she lived for almost 60 years in her dream home, built with her husband. Carolyn was a loving and supportive mother, grandmother, and great grandmother; and a giving and compassionate friend, always making time for her family and friends and putting them first above herself. Since childhood, Carolyn was known as “Lucky” by her immediate family, a nickname that stuck with her throughout her life and was truly befitting of her as a person. Carolyn looked forward to reconnecting with her family in the kingdom of heaven. She is predeceased by her husband of over 60 years, George Ernest Deodato Jr, and infant daughters, Maria and Mary Loretta Deodato; her parents, Frank and Louise Stankiewicz; and her beloved older sister, Lillian Stankiewicz Iero. Carolyn will watch over and pray for her family from heaven. She is survived by her daughter, Karen Louise Deodato Swift; her son, John Joseph Deodato and his wife, Sandi; her older sister, Mildred Stankiewicz Oswald and her husband, Joseph; her younger sister, Marianne Stankiewicz Battista; her oldest granddaughter, Maria Carolyn Swift Rickert and her husband, Michael; her granddaughters, Laura Rachel Swift and Juliann Nicole Swift; her great grandsons, Liam Gannicus Rickert and Jack Matthew Rickert; her cousin, Mary Lou Kramli; her extensive church family at St. Ann Roman Catholic Church, and her treasured friends. Carolyn was a faithful servant of the Lord, and an avid member of her parish at St. Ann, participating in the Resurrection Choir and St. Ann’s Adult Choir; and volunteered her time at theMorris Hall Gift Shop. Throughout her life, Carolyn was passionate about the arts, music, and gardening – an accomplished watercolor painter, and prided herself on the beautiful and creative flower gardens she planted and maintained. She enjoyed traveling around the country and the world with her family and close friends of over 45 years, Michael and Marilyn Starr. She is remembered for her service to others, Carolyn took great joy in helping those in need, and spreading the Lord’s word. Family and friends may call on Friday morning, March 22, 2019, from 9:00am to 10:45am at The Church of St. Ann, 1253 Lawrence Road, Lawrenceville, New Jersey, 08648 to celebrate Carolyn’s life. A Mass of Christian Burial will follow at 11:00am in the church. Burial at Washington Crossing National Veterans Cemetery will be private. To send flowers or a remembrance gift to the family of Carolyn Frances Deodato, please visit our Tribute Store. "Email Address" would like to share the life celebration of Carolyn Frances Deodato. Click on the "link" to go to share a favorite memory or leave a condolence message for the family.